WOW WEE TOYS Robosapien X is a human robot that can be an excellent gift that brings joy not only to children but also to adults. This is an updated version of the main generation of robots, characterized by the presence of a device with an IR port in the form of a nozzle, connected to a phone/tablet. Then you need to install the application “WowWee RoboRemote” and now the robot understands the commands not only from the remote control, but also controlled from the phone or tablet. It can be controlled using a remote control (RC), or from a nozzle device from a phone/tablet. The robot Robosapien X is capable of performing any, even complex movements or a whole range of movements. You can program a toy robot from the console. And it can any preschooler, without asking for help from their parents. Robot-man has great opportunities, it all depends only on the owner’s imagination. Programmable movements of the robot-man include up to 84 steps, you can independently program sensors on your arms and legs, as well as an acoustic sensor, free programming is possible (that is, you can start a previously entered program by pressing one button on the remote). For example, you need to program the right sensors of the Robosapien robot toy (on the arm and the leg). To do this, press the large button at the bottom of the console to the right and then press the buttons that are responsible for moving (moving) the robot toy. But in the process of programming, the robot does not perform these actions, but only memorizes them, while quirking amusingly. After pressing six different (combination or identical) buttons on the remote, the robot-man automatically exits the programming mode and starts responding to pressing the buttons. So, the programming of the robot Robosapien is carried out. Running a command is possible not only by pressing the keyboard shortcut on the remote but also by simply touching any sensors on the right side of the toy. The human-robot Robosapien X was designed so that everyone can choose the appropriate level of difficulty. Not surprised that he likes and adults. Quite often, a toy robot is presented to 3-4-year-old babies. Children from six years old can independently master all the possibilities of the robot. The legendary Robosapien is one of the first robots in the WowWee toy line. Able to perform 67 difficult teams, including grabbing and throwing objects. He can show you karate or dance. If you want, will whistle and snore. Explore the capabilities of your Robosapien and program its behavior! Infrared receiver. Built into the head. Through it, the robot accepts commands. Indicators in the eyes. Light up red and blink when the command is executed. Acoustic sensor. It perceives sounds in the appropriate mode. Light indication on the palms. Lights up when you move the robot arm or press the stop button. Hand sensors. Perceive any touch of the fingertips. Sensors stop. Perceive any touch of the fore or aft edge of the foot. Red command buttons directly control the movement of the robot (arms and legs). Green command buttons are used to perform combined actions (pick up, throw and others). The buttons of the orange commands are used to perform actions with the expression of their attitude (well done, bad and more). raise and lower hands, move your hands to the body and from the body, tilt the body forward, back, left and right, move forward, back, left and right, strike with hands, pick up objects with your hands (container, convenient for lifting, are included in the kit), throw objects, turn your head, listen, sleep, give five, talk, whistle, growl, demolish everything in your way in the “Bulldozer” mode, dance, show karate, sometimes he has belching and indigestion. You can program a touch response on all sensors on the fingers, toes, and heels. For example, teach him to bypass obstacles encountered on the way. You can also program the reaction of the robot to a loud sound. He will perform up to 6 actions in sequence. Invent and program the “Main Team” and the robot will perform up to 14 actions in sequence. 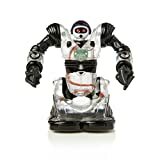 Robot toy black and white man Robosapien X – this is the popular man Robosapien, complemented by an additional infrared port for a smartphone. The WowWee electronic key is compatible with iPhones, iPads and other I-devices, as well as Androids. To use the functions of the electronic key, you need to plug it into the headphone jack of the phone and download the corresponding program in the App Store or Google Play. The program is called WowWee RoboRemote. You can simply follow the link: AppStore.com/wowweeroboremote. 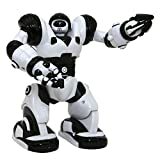 Toy Robot Robosapien X is a black and white Robosapien X from Wow Wee, probably the most common robot toy Robosapien that walks, picks up objects, dances, burps, is programmed from the console, and now with the ability to control from your smartphone. WowWee is an American company, and licensed production is located in China. By controlling Robosapien X from the console, you can send it anywhere. He is able to perform complex movements – pick up objects, throw them, perform movements of kung fu. The sensors on the legs and arms are programmed and the robot can bypass obstacles encountered in its path. In addition, the toy can react to any sounds and execute your commands previously entered into the “acoustic sensor”. There are several demo modes that demonstrate all the capabilities of the robot – movement, dancing. Robosapien X will be an excellent gift for children and a worthy alternative to computer games, and most importantly, not harmful to the health of the baby. The robot toy is so interesting that children play with it for a long time.